The latter came in the very complete and pure form in which they were taught to Gampopa through the Kadampa lineage. Both Gampopa and Dagpo Rinpoche are names derived from places (Mount Gampo and the Dagpo region of Tibet) where he later taught. He was born in the year 1079. Sometimes merely hearing his name or physical contact with him could heal diseases. He invited Śākyamuni Buddha and his other Bodhisattva disciples to his home. There, Śākyamuni Buddha gave a teaching on the Sūtra known as the Samādhi Rāja Sūtra. Chandra Prabha Kumara promised Śākyamuni Buddha that he would spread that Sūtra and make its profound teaching on the nature of mind available for future beings. When he made that commitment, Śākyamuni Buddha also promised that during the time when the Bodhisattva would actually spread the Sūtra and benefit all living beings, he himself would help cultivate and establish the teaching firmly. Many thousands of Bodhisattvas spontaneously offered to also emanate at that time to help him. This is seen as the birth of the Kagyu/Mahāmudrā lineage. To fulfil this promise, the Bodhisattva took birth in Tibet. He was a gifted child, interested in many things, who grew up to be both a doctor and a wise Buddhist, receiving teachings from various gurus. At that time his name was Sonam Rinchen. He had a wife and two children but this only lasted until he was 24 years old, at which time his children died from an epidemic, one shortly after the other. Then his wife became very ill. Even his skilful medicine could not do anything to heal her. But although she was in great pain and seemed to be dying, she was unable to actually let go of life and die. Realizing this, he asked her why she seemed to be so attached to her life. It is because my attachment to you is so very strong that I am unable to die." Sonam Rinchen promised that he would take the vow of complete celibacy, never to marry another woman, and to become a monk. This promise released her from her unnatural attachment, and she left her pain-racked body and died. There he practiced meditation through the Kadampa tradition and saw signs and had many mystical experiences. Yet this practice did not satisfy him completely. They seemed pretty hungry, and they were sitting around fantasising about what they wanted. One of the beggars said, "I wish a cup full of tsampa, with lots of butter, would fall from the sky, and we could all enjoy it." "Come on, that is too small a thing to wish for, just a cup full of tsampa. That is nothing. I wish I were a king. In fact, I wish I had the power and the wealth of the kings of all Tibet." "Well, gaining possessions or becoming a king seem very temporary to me. Since everything is impermanent, everything is bound to change. I wish," he said, "that I had the power and realization of the great yogi Milarepa. That realization, that energy and power, is not destructible, is not subject to change." On hearing the name of Milarepa spoken thus by the beggars, Sonam Rinchen immediately fainted; so strong was the connection sparked in him when he heard Milarepa's name, that he just passed out. He asked the older beggar about wanting to be like Milarepa, where Milarepa lived, and the direction he should take to get there. When he obtained that information, he immediately and without a second thought left the retreat hut to find Milarepa. She asked who he was, and he said he was Sonam Rinchen and had come to meet the great yogi known as Milarepa. The lady then insisted that he stay at her house, because not only she, but her daughter also, were devoted students of Milarepa. In fact, Milarepa had told her and her daughter that the son of a very noble family and a future great disciple was coming to be his student, and that they were to assist him in any manner they could. Milarepa had also told her daughter that they would accumulate great merit in accommodating him, so they hoped he would stay the evening. They apprised Sonam Rinchen of these facts and he felt some pride. "You have developed pride, you have become quite egoistic, therefore you must remove the stain of that pride. Keep the firewood, go under a rock, and stay there until you have purified the stain of pride." 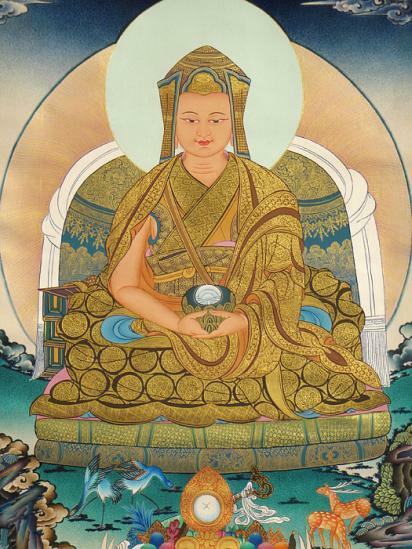 Sonam Rinchen stayed under a rock for half a month to purify his small impurity of self-importance. After half a month, Sonam Rinchen was really not expecting anything to happen, having lost the hope of expectation. When Milarepa called for him to come, he still had no expectations. "Actually," Milarepa told him, "although you have just come to see me, we were never really separated before." And when Milarepa said that, Sonam Rinchen realized that the 3 beggars who were chatting outside his retreat hut were really emanations of Milarepa. Milarepa then asked him what his name was now, and he replied that it was Sonam Rinchen. Milarepa then told him that "Sonam" means "merit," and that his merit was inexhaustible and infinite; and that "Rinchen" means "precious," so he would be very precious to all sentient beings. At this time Sonam Rinchen was hesitant to take the beer. After all, he was a Kadampa practitioner, a fully ordained monk who was supposed to abstain from any drinking. Also, he was with the great Milarepa and surrounded by all of his students, who were also yogis. Because of all this, he was reluctant to take the beer cup. "Get beyond this inhibition, abandon all these thoughts and preconceptions. So Sonam Rinchen drank all the beer that was in the skull cup, without leaving a single drop. This was token of him obtaining, in the future, the complete teaching from Milarepa. As he was able to drink the beer without leaving a drop, he would be able to obtain the complete teaching from Milarepa without missing any points or teachings at all. After that, Sonam Rinchen offered to Milarepa the offerings he had brought: some gold dust and a bag full of tea. "I have no pot, no vessel to boil the tea in, and," he said, "I am not that favourable to gold, either. You keep the tea. Also, you keep the gold dust. You might need to use it yourself."